Market Sizing: How big is online video advertising? Television advertising still dominates the scene when it comes to advertising revenue. Yet in the last 5 years, Internet advertising has nearly doubled proving that there is little doubt that advertising is increasingly going online. Within Internet advertising, the video advertising component, while still relatively small, has been growing steadily resulting in a tremendous opportunity for innovative entrepreneurs disrupting this emerging market. **Applied a multiplier of 4 to get the global market size. Doing a quick search through the Wall Street Journal – it appears that they agree with this market size of $4B for the U.S. market. It is important to note two trends in the video ad market that matter and will significantly impact the size of the market. 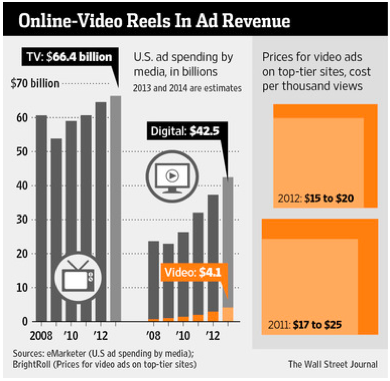 1) Contraction Force: The average price per video ad is decreasing. In 2011 at top tier sites ads were in the $17-$25 range. In 2012 that range fell to $15-$20. The WSJ argued that this price will only decrease further from here. 2) Expansion Force: Video advertising may only be a $4B market as of 2012, but it is an increasing segment of the overall $42.5B digital media market—a market which is growing in size itself. The net effect of these two forces is hard to determine as they act in opposite directions, but the overall affect will likely be an increase in the market size in the next 5 years, especially as the internet plays an increasingly important role vis a vis the television. Author allenPosted on July 29, 2013 Categories UncategorizedTags advertising, market sizeLeave a comment on Market Sizing: How big is online video advertising?